I use it everyday hangin nightly with a moisturing shampoo in the mornings to remove the harsh and wire like feeling of the hairs. I don’t understand whhy you don’t use it because of of the harshness. It’s better to have hair and harsh than no hair at all. And there are tons of studies that prove shedding to be a positive sign. There is no study on this planet that shows a hair loss medicine causing shed and not regrowing thicker fuller and stronger. Those who are best respondants shed the most. you probably were experiencing the infamous “anti-androgen shed” that many many finasteride and dutasteride users get in months 1-2, only to see their hair start to be noticebly thicker by months 7-12. I once used nizoral on a wrist for three months and left it on for several minutes in the shower each time, about three times a week. The left wrist got hairier and had longer hair-----which suprised me because I expected it to just have an anti-androgenic effect and for their to be less, not more hair there. Its both an anti-androgen and hypertrichotic. Whatever the creams (or mousses) instructions are…it woudl probably be best to simply follow them. Those regrowth pics are amongst the finest produced by any treatment thusfar. » to remove the harsh and wire like feeling of the hairs. » better to have hair and harsh than no hair at all. » And there are tons of studies that prove shedding to be a positive sign. » respondants shed the most.
" It does have a ‘drying’ effect on hair. " Been using it 3-4 times a week ever since last ht procedure 2003. I use infusim leave in treatment right after never noticed dry out effect. » hair start to be noticebly thicker by months 7-12. » less, not more hair there. Its both an anti-androgen and hypertrichotic. » probably be best to simply follow them. Benji, do you think its safe to use a 2% dosage daily? » » hair start to be noticebly thicker by months 7-12. » » less, not more hair there. Its both an anti-androgen and hypertrichotic. » » probably be best to simply follow them. » Benji, do you think its safe to use a 2% dosage daily? Probably not necessary to do so. The nizoral website says that keto has been found in the dermis at ‘therapeutic concentration’ seven days after application. I would think using it 2-3 times a week, and leaving the suds in for several minutes would get it through the outer dermis. I think the 2% version’s instructions say to leave it in for some minutes. I guess if a guy got some anti-androgenic sides from it, he could just quit using it so much, but Ive never heard anyone complain about sexual side effects from external ketoconazole usage. Just for the record. Its only been a few days since I’ve been using Niz everyday. There has never been a shampoo that’s made my hair look so damn THICK!! Generally it looks limp and flat, but now I use water to weigh it down every now and then. » » Benji, do you think its safe to use a 2% dosage daily? » version’s instructions say to leave it in for some minutes. » side effects from external ketoconazole usage. 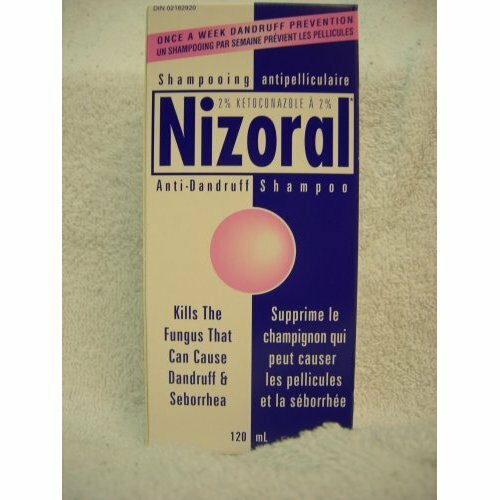 Nizoral (2% ketoconazole) Anti-Dandruff Shampoo, by McNeil.